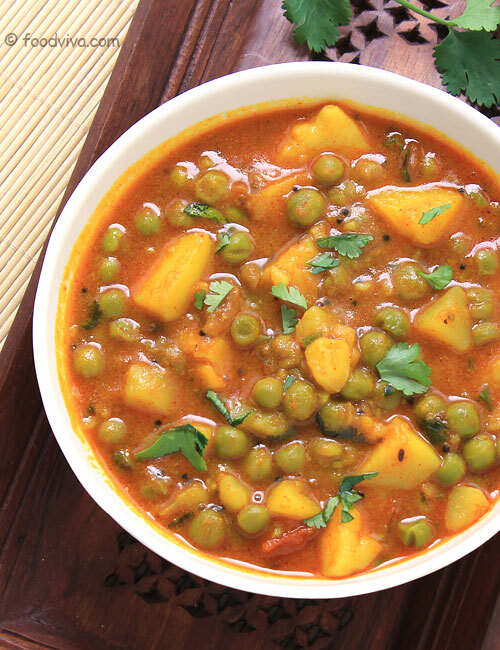 Aloo Matar is a mouth watering Indian curry of potato and green peas that tastes delicious when served with phulka roti, chapati or paratha in lunch or dinner. 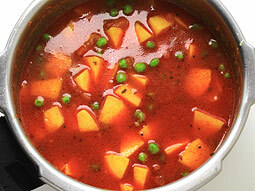 This curry is very easy to make using a pressure cooker within 15 minutes. 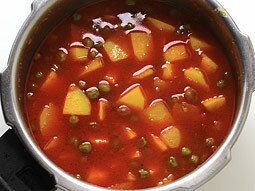 Follow this easy, simple and healthy aloo matar curry recipe today and give treat to your taste buds. Peel and wash the potatoes. Cut them into 1/2-inch pieces. 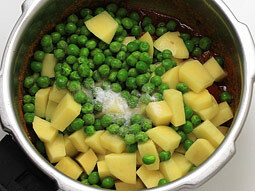 In this recipe, frozen green peas are used but you can use either fresh or frozen green peas according to the availability. Heat 2 tablespoons oil in a pressure cooker over medium flame. 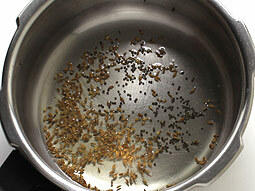 Add mustard seeds; when they begin to crackle, add cumin seeds. 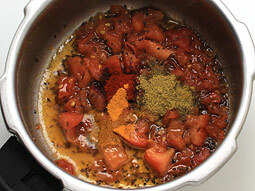 When cumin seeds turn light golden, add finely chopped tomato. 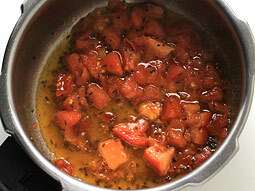 Stir and cook until tomato pieces turn soft. 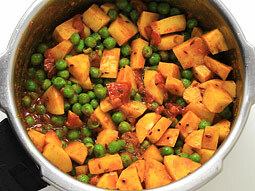 Add 2 teaspoons cumin-coriander powder, 3/4 teaspoon red chilli powder and 1/2 teaspoon turmeric powder. 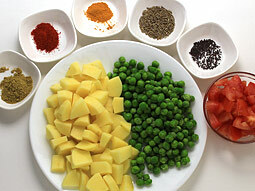 Add chopped potatoes, green peas and salt. Add 3/4 cup water and mix well. 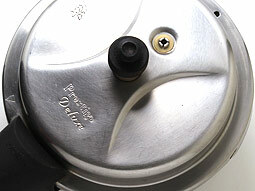 Close the lid of pressure cooker and cook for 2-whistles over medium flame. Turn off the flame and let the pressure inside the cooker comes down naturally. Remove the lid. Mix well and taste the curry. If required, add more salt and mix well. If the curry has more gravy or looks watery, cook it for few more minutes or until you get the desired consistency of gravy. Garnish it with chopped coriander leaves. 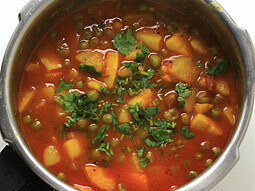 Aloo matar curry is ready for serving. Add 1 teaspoon ginger-garlic paste in step-2 for variation. 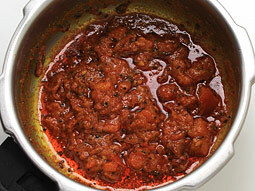 You can also prepare this curry in a pan or kadai. However, it will take more time to cook compared with pressure cooker. 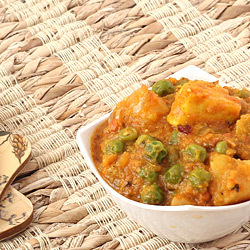 Serving Ideas: Serve Aloo Matar Curry with phulka roti or chapati, rice, dal and buttermilk or lassi as a complete meal in lunch or dinner. Very homemade taste without the creaminess - simple yet delicious! Perfect for any meal.... especially one over a weekday. You really are amazing!! !